Kolejna miła niespodziana dla fanów Spaltoona 2 na Nintendo Switch. 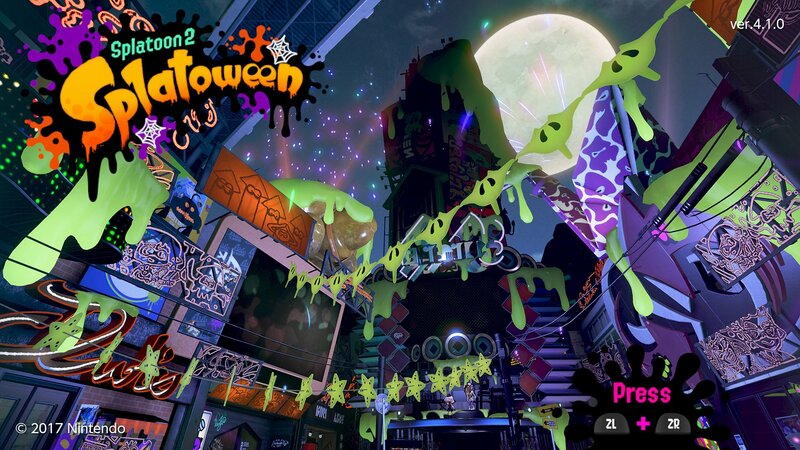 Z okazji zbliżającego się święta duchów Nintendo przygotowało specjalny tematyczny Splatfest nazwany Splatoween. Oczywiście tematyka będzie odpowiednia do okazji, tym razem zmierzą się teamy opowiadające się za cukierkiem lub psikusem. Zabawa rozpocznie się 19ego października o godzinie 16:00, a zakończy 21ego o tej samej godzinie. A wy którą stronę wybierzecie? 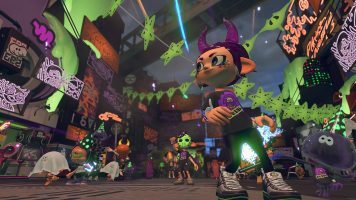 Wraz ze Splatoweenem przyszła do nas aktualizacja do wersji 4.1.0 wnosząca nową mapę Skipper Pavilion, nową muzykę oraz cztery nowe bronie będące rozwinięciem znanego już oręża. Szczegóły aktualizacji znajdziecie na końcu tekstu. Specjalnie na czas Halloween zmieniony zostanie również wygląd miasta i postaci pojawi się dużo zielonej mazi i nowe elementy ubioru takie jak np. rogi. Pumpkins and bedsheets at the ready for a super spooky #Splatoon2 Splatfest, or, as we're calling it – Splatoween! Added four new songs that will play during multiplayer matches. Fixed an issue causing a player super jumping to an ally’s location in the midst of returning to their starting location after using an Inkjet to super jump into unintended locations when network connectivity was poor. Fixed an issue when dodge rolling on the inside of a grating, in which the player mistakenly rolled the same distance they would when on the ground although they were moving in midair. Adjusted the sound effect caused when an opponent enters the area of effect of Toxic Mist, making it easier to distinguish if they are nearby or far away. A sound effect will now play when using the gear ability Drop Roller. Fixed an issue preventing players from tossing a bomb or clam when using the Nautilus 47 if the bomb or clam was thrown at the same time the charge from a stored charge shot expired. Fixed an issue on the stage Starfish Mainstage, causing player movement to become slowed slightly when moving across a specific slope near the spawn points. Neo Sploosh-o-matic When shots hit, their ink splatter will now extend further forward than it did previously. Custom Splattershot Jr. When shots hit, their ink splatter will now extend further forward than it did previously. Aerospray RG When shots hit, their ink splatter will now extend further forward than it did previously. Forge Splattershot Pro Ink now more likely to land around player’s feet when firing. Made the ink splatter that lands closest to the player when firing more likely to land closer to the player than it did previously. .96 Gal Deco Extended firing range by roughly 6%. Gold Dynamo Roller Will now also ink turf closer to the player in addition to previous ink coverage when performing a horizontal swing. Foil Flingza Roller Extended range in which a horizontal swing will deal 100.0 or more damage by roughly 5%. Custom Goo Tuber Increased firing range of a minimally charged shot by roughly 27%. Accordingly, firing range of other non-fully charged shots has also been increased slightly. Zink Mini Splatling Ink splatter from fired shots now hits with a wider vertical spread than it did previously. Nautilus 47 Increased velocity of fired shots by roughly 133%, while making no change to firing range. Undercover Sorella Brella While damage from a single shot remains at 40.0, the damage from peripheral ink splatter has been increased from 10.0 to 12.0. Splash Wall Decreased the time between using the Splash Wall and when ink recovery begins by roughly 15/60 of a second. Tenta Missiles Shortened time between firing of each missile. Splashdown Decreased reduction of special gauge if the user is splatted in the time between activating the special but before landing with it from 50% to 25%. Increased damage dealt by the Splashdown to bubbles fired by the Bubble Blower, ensuring that they will be destroyed if struck by it. Decreased the points required for using the Splashdown special in several of the weapon sets that include it. When playing Ranked or League Battles as a pair, your rank meter, X Power, or League Power will no longer decrease when playing with fewer members on your team due to internet disconnections for an even shorter period than was previously the case. If internet disconnections prevent a player from finishing enough matches out of the last few dozen matches played, the decrease to their rank meter or X Power for each subsequent unfinished match will be greater than it was previously. Players are now able to review stats for their last 50 Salmon Run jobs via the SplatNet 2 portion of the Nintendo Switch Online smart device app. Fixed an issue causing players to take contact damage if they had been standing in the location an enemy appeared just prior to that enemy’s appearance. Players can also choose not to enable voice chat when creating rooms in this way. 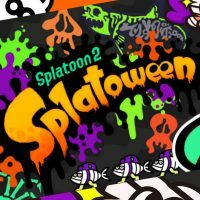 This applies to the following modes which previously functioned with the Online Lounge feature: League Battle, Private Battle, Splatfest Battle (Normal) with friends, With Friends (Salomon Run). Fixed an issue occurring after Splatfest Battles, in which the Splatfest rank meter would go up continuously and repeatedly. 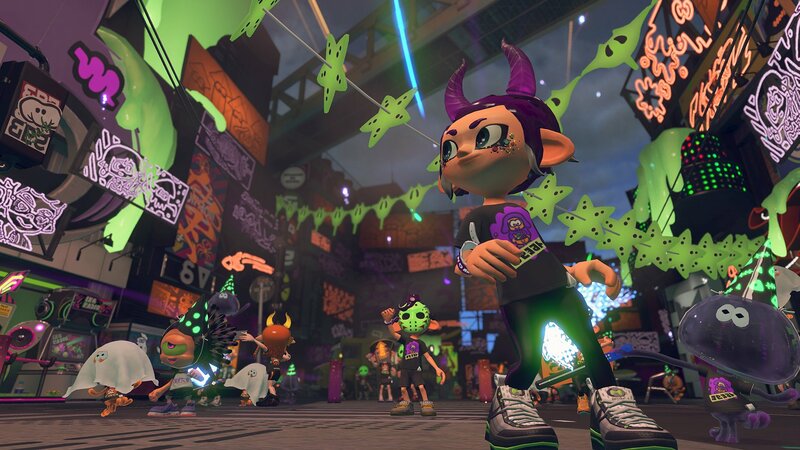 Fixed an issue occurring in Splatfest Battles while under the effect of food items that increase experience or money, in which the player failed to earn gear ability chunks even after their Splatfest Tee had reached its highest level. Fixed an issue when using an amiibo to change equipment in the lobby in which the vibe meter at the top of the screen would mistakenly display information for the weapon used before making the change. Fixed an issue causing certain sound effects not to play when doing recon on the stage Starfish Mainstage. Fixed an issue causing platforms on the stage Ancho-V Games to move more during recon than in a battle when hit directly by a shot fired while using the Inkjet special.